About The Book Nowadays, the number of gyms and yoga clubs are increasing at a steady rate and so are the roads getting crowded with runners trying to drop a few extra pounds. While all this is good, many find themselves stuck with injuries to deal with, along with disillusionment when results don't seem to surface. This results in fads, which was the exact situation five years back, when Diwekar released her debut fitness guide, Don't Lose Your Mind, Lose Your Weight. Diwekar explains that people often find themselves without results due to the lack of understanding as to how exercise works and ways to make it work for themselves. Diwekar goes on to talk about practically every myth pertaining to exercise, demystifying it to help the readers understand that exercise isn't a brainless activity, but in essence, a science. She explains that exercise is potent enough to tackle any kind of lifestyle disorder, which may include obesity and diabetes, much better than any form of medication. Diwekar provides the readers with detailed information regarding cardio, yoga and strength training, while tackling post-workout nutrition, which is a key factor often overlooked by many fitness enthusiasts. Don't Lose Out, Work Out! is a perfect guide for individuals of varied fitness levels. The readers are also provided with sample training routines and real life workout examples, which will help them achieve the kind of body they've always wanted. 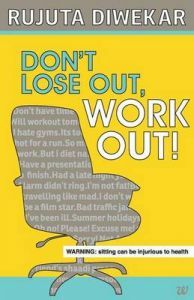 This paperback edition of Don't Lose Out, Work Out! was published in February 2014, by Westland. About the Author: Rujuta Diwekar is a renowned nutritionist and author. She was bestowed with the 'Nutrition Award' by the AIG (Asian Institute of Gastroenterology). in 2012, she was voted as one of the 50 most powerful people in India, by the People Magazine. Some of Diwekar's clients include Anupam Kher, Kareena Kapoor, Anil Ambani and Karisma Kapoor. Diwekar's famous works include Don't Lose Your Mind, Lose Your Weight, Women & the Weight Loss Tamasha and Khaiye Aur Vajan Ghataiye.